Digital publishers and online content creators are always adapting. Few industries have more moving parts than the publishing space, yet the rewards of a $70 billion dollar ad industry, with 20% year over year growth, provides more than enough incentive to stay current with all the variables in the field. 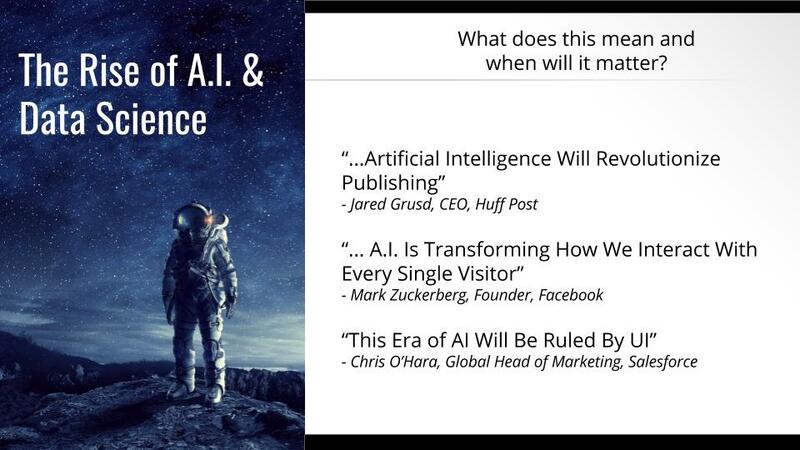 The biggest buzzwords and trends in the digital publishing space right now are “artificial intelligence” and “data science”. A quick analysis of popular industry conference topics will instantly highlight just how popular these terms have become for publishers recently. However, the rise of these subjects underlines something even more important… the vast importance of data and what publishers should be doing with it. Below, I’ll deliver some of the key points I recently discussed at Pubtelligence — which was hosted at Google. I’ll highlight key trends in the digital publishing space and show where I think the most successful publishers will be headed in the next 5 years. This sort of feat was impossible just 5 years ago. Even if that kind of data could have been collected, the machine learning technologies and data science processes required to support this kind of initiative simply wasn’t ready. This is why data science and A.I. are becoming hot topics for large publishers — and even small ones. The problem is that these concepts seem very arbitrary and far away. The conversation that actually makes more sense is the one we should all be having about data, and just how far behind most publishers are vs. advertisers… but before we get there, we need to understand why. 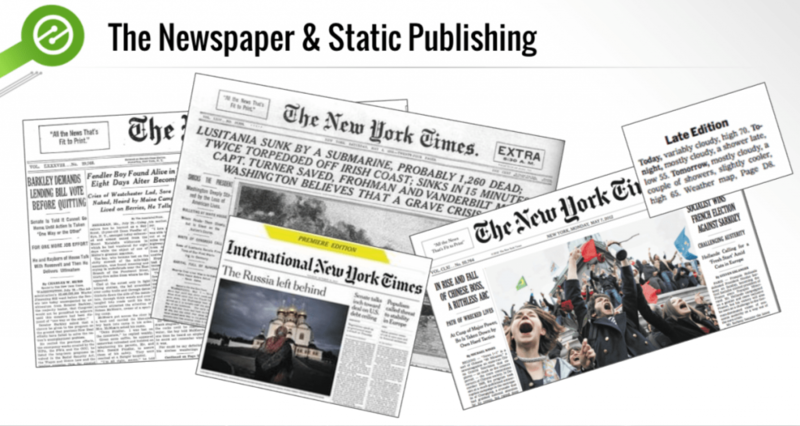 A lot of the way publishing works can be traced back to the early days of the newspaper. This is where we digitally borrow terms like “above the fold”. There used to be a physical fold, and the stuff that ran above it was above the fold. Unfortunately, the terminology is not the only thing publishers are still borrowing from days past. Even in the early days of the paper, publishers recognized the need to change elements of their publication to fit the needs of different audiences. This brought us late editions, international versions, and even west and east coast variations of the same publications. 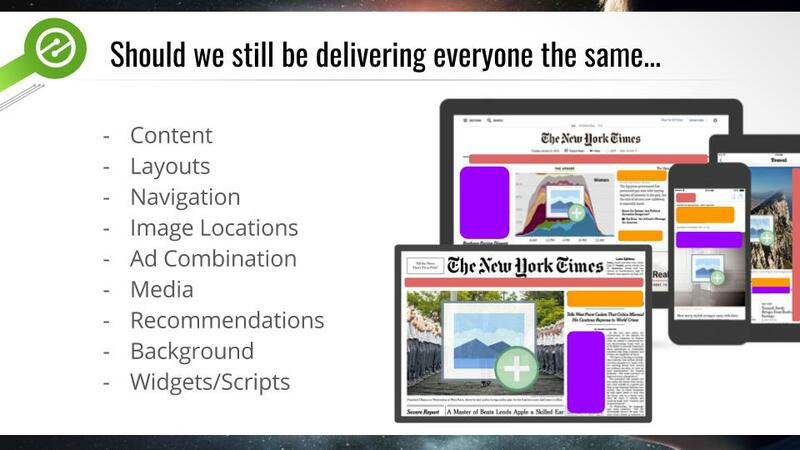 This is not something that has continued to evolve as publishers have transitioned to online media. In fact, publishers are actually adapting to their audiences less in many cases. This is where digital publishers are starting to fall behind advertisers. The data that is driving things like personalization and adaptation is rapidly growing in the advertising and programmatic spaces, but not in the publishing arena. Is user behavior like the weather or can publishers affect it? In the example below, there are two users on a jiu jitsu website. One with outstanding visitor metrics, the other with rather poor ones. We know that visitors like “Tyler” (me) generate more revenue and are correlated with improvements in things like organic traffic. Visitors like John, not so much. This begs the question, what can a publisher do about this? Given enough data, can a publisher actually change John’s behavior to be more like Tyler. Research — and also common sense — tells us that user behavior is flexible. 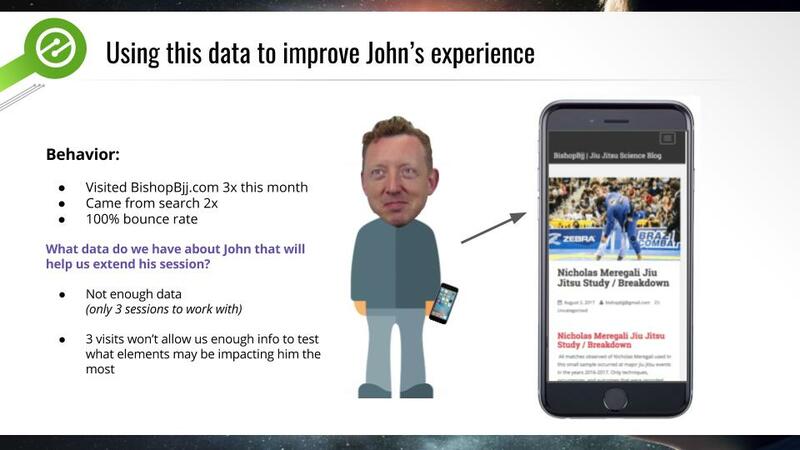 It might not be possible to make John like me, but it is possible to improve his metrics. Even if John doesn’t like jiu jitsu, there are probably ways to influence him to visit additional pages and spend more time on the site. Those things are just probably different than the ones that influence people like me to visit additional pages. Research tells us there is a lot of value here…. This is where the problem lies. 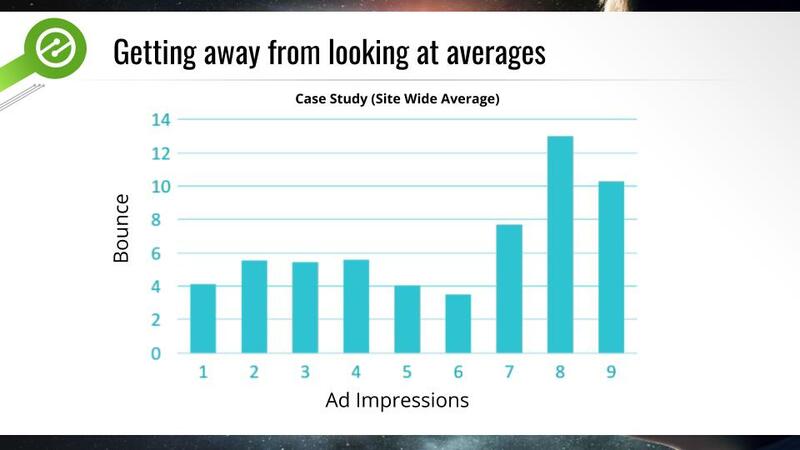 Publishers are at a disadvantage in this massive industry vs. advertisers. 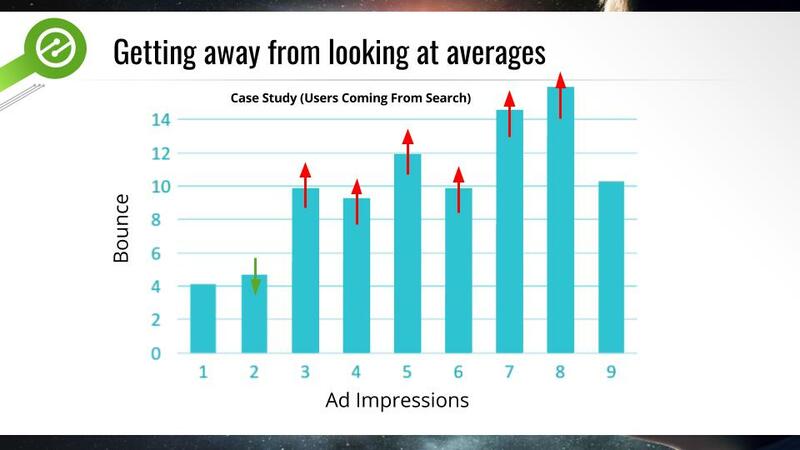 Advertisers act on much more information about visitors than publishers do. If I’m selling a car and I know that the engine is bad, but the buyer doesn’t know this, there is an asymmetry of data. In this case, this asymmetry favors me. I know much more about the value of the car than the buyer does; which gives me the upper hand. 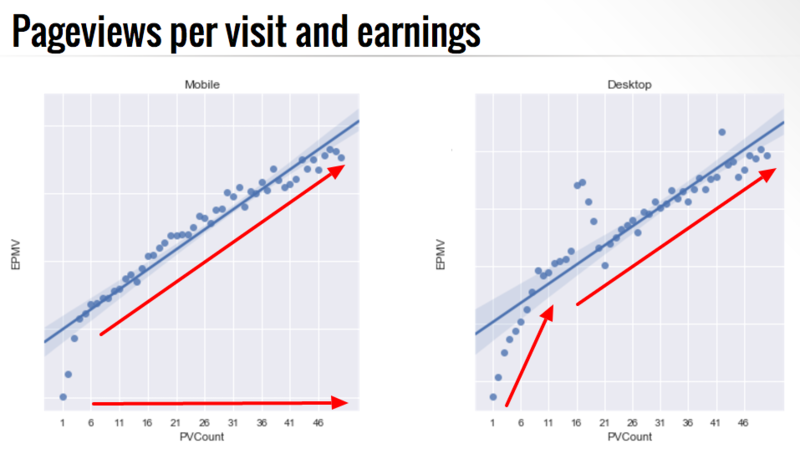 Advertisers are acting on visitor data much more than publishers are at the moment. 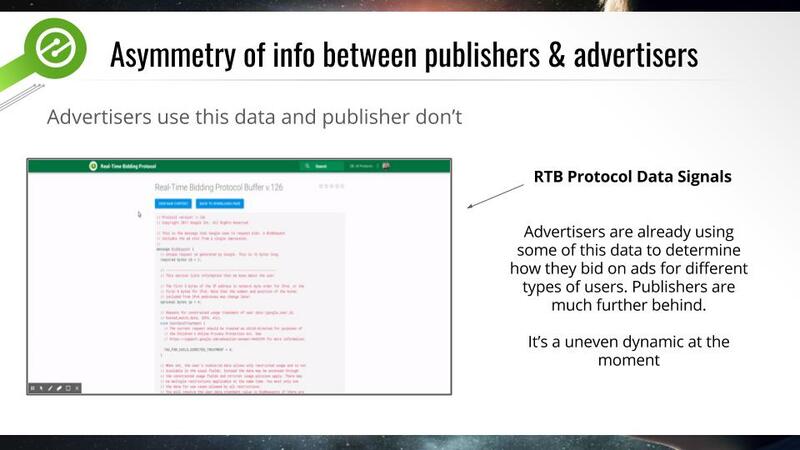 A good example of this is the ad exchange bid index below. 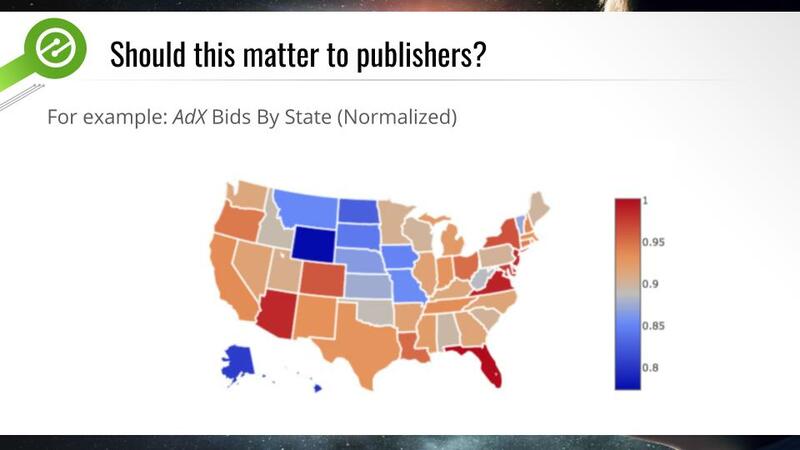 You can see how advertisers are actually altering inventory bids by state (actually they do this by zip code). This becomes a real issue because — programmatically — publishers are likely not understanding the value of their inventory the way advertisers do. Even if they are, they may not be able to make the adjustments necessary to truly capitalize on the data the way advertisers can. Aside from altering things like bid prices, publishers could be using this information to alter the way their website treats visitors to account for things like time of day to influence visitor behaviors (since UX is directly correlated to revenue). What decisions could be made on this information? Maybe none. However, if we look at all the data available, it becomes pretty obvious that if publishers truly understood their audience inside and out that they could easily find things to change to influence these kinds of behaviors. They key is identifying triggers in the data and factors that influence them. 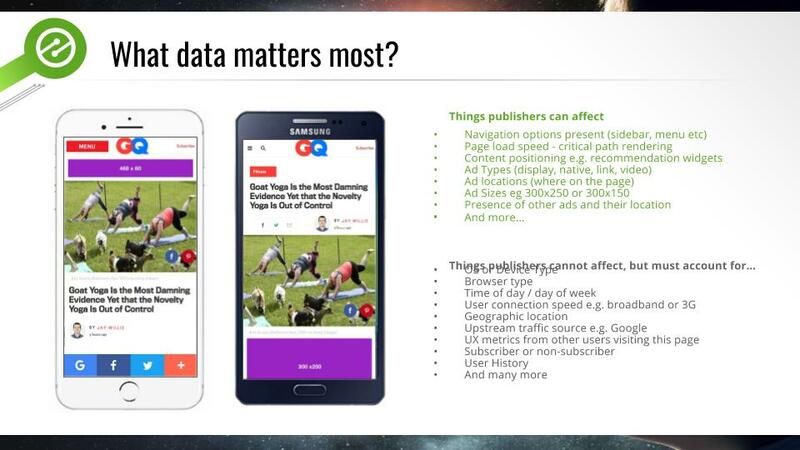 What data will matter most to publishers? This is best defined in two categories. There is data the publisher can affect; basically everything on the page, and things they cannot affect; all the attributes of the visitor. This is the data that the advocates of data science and artificial intelligence are looking at closely. 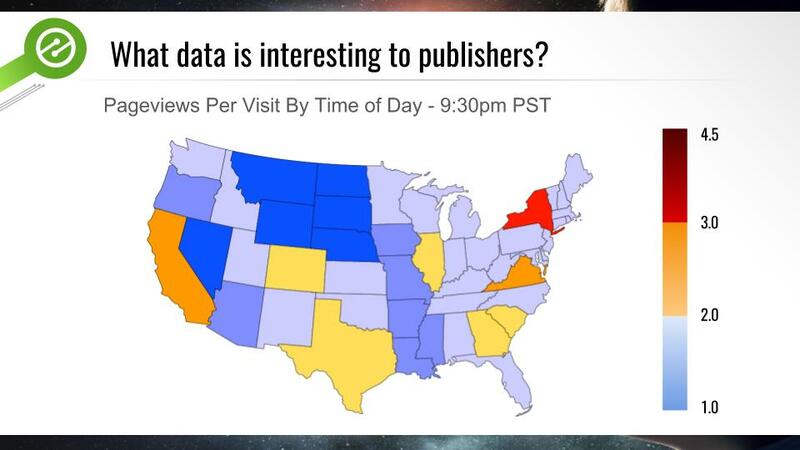 What trends exist on both sides of this data that publishers can leverage to influence behavior and generate more revenue. What should the goal of this data be? There are really three things publishers are always optimizing towards revenue, traffic, and user experience. These factors encompass the most important bottom line elements of digital publishing. All three are best represented by a metric we discuss a lot — EPMV (earnings per thousand visitors) — or “session earnings”. 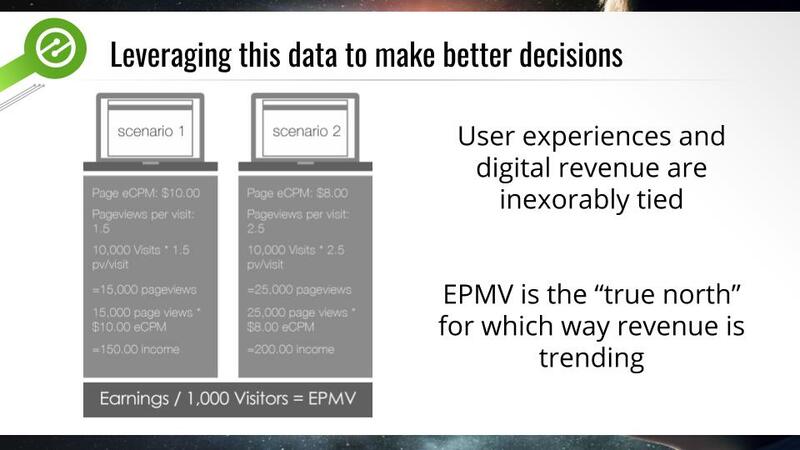 I don’t want to dive into this too much, but if you aren’t familiar with why EPMV is a “true north” for publishers, check this out. 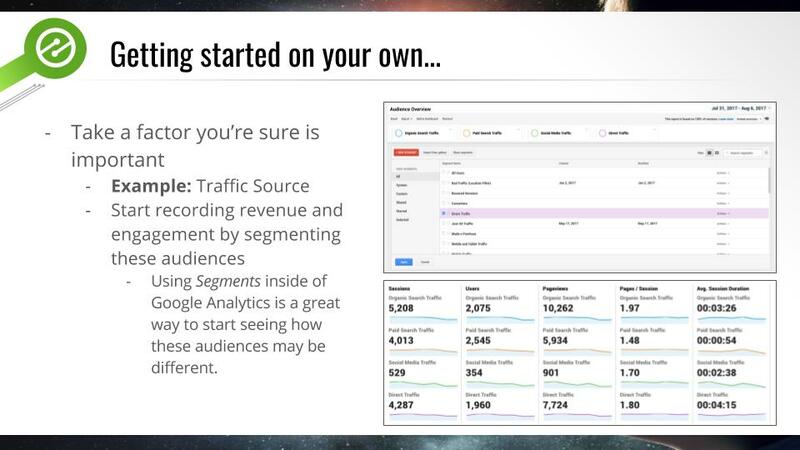 Using all of the data we highlighted above will allow publishers to account for traffic, UX, and revenue together when applying data-driven strategies to their growth. 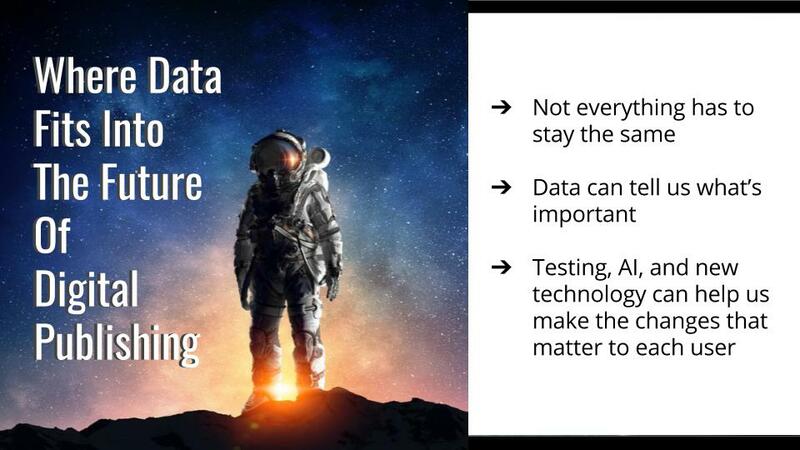 This is ultimately the goal of things like data science and A.I. for publishers, right? To be able to understand signals in the data and make adjustments to different variables in real-time to improve outcomes. This is essentially the role A.I. intends to play in every industry. Will it work for publishers? Kind of. If we think that publishers can look at every user’s individual behavior and make real-time adjustments to things like navigation or ad placements to improve UX and revenue for that user, it’s unlikely that it would offer much real benefit. Why? There isn’t enough data for a single user. This is where data science comes in. 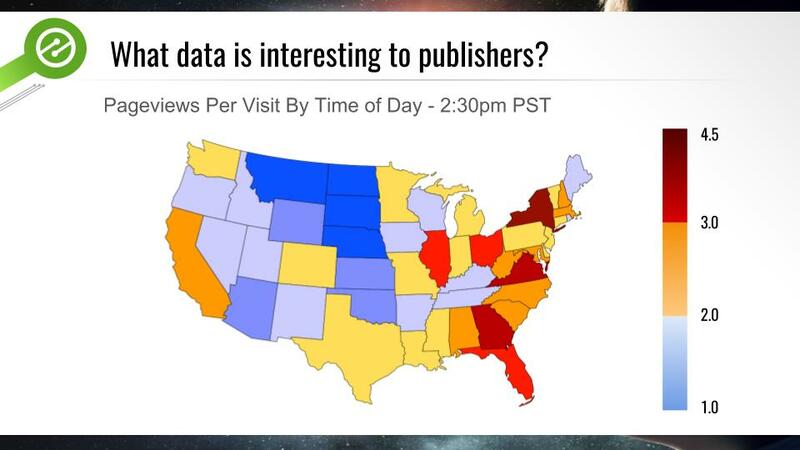 We can go back now and use all that visitor data that publishers cannot affect (device type, geolocation, etc.) 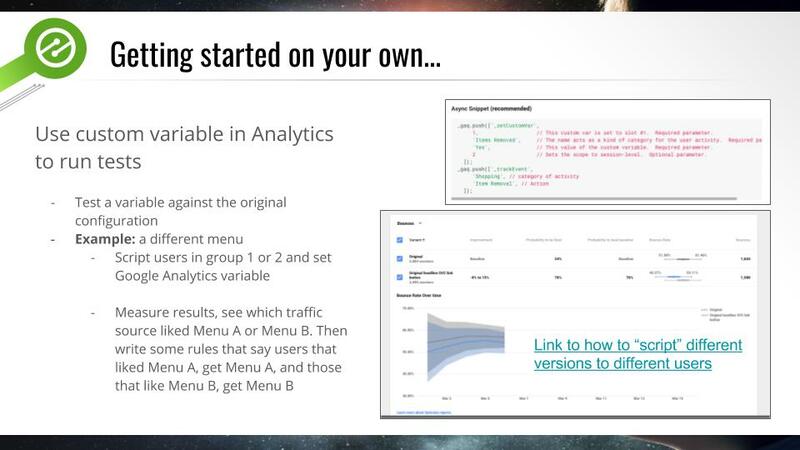 to group users together based on behavior trends. Why do publishers need A.I. for this? The key problem with all of this is that to get the data publishers need to actually influence behavior in a meaningful way, user testing is required. Testing is the only way publishers can know how visitors on their site react to specific changes. More accurately, they need to know how different users respond to all the potential changes that could be made before they can do any level of personalization. This is a problem because most forms of testing that publishers are familiar with have what’s called a “losers dilemma”. 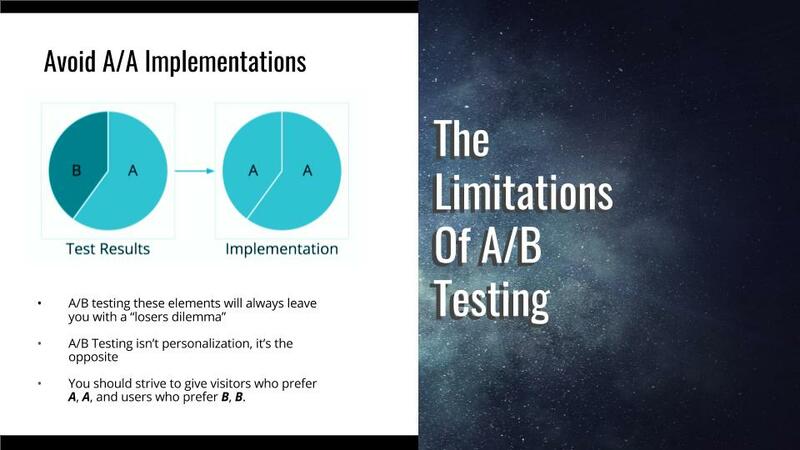 This essentially means that publishers will test variables and will ultimately implement the variable that the highest percentage of visitors prefer. Unfortunately, all the users that preferred different variables are stuck with the one the majority preferred. The ideal scenario is that everyone is delivered the variable that best fits them. This is where A.I. can fit in. Artificial intelligence could allow publishers to test all these variables against look-a-like audiences and essentially deliver everyone the variables that extend their user session or earn the most revenue (or any combination of other goals). Here’s a good example of why this is so impactful. In this case study above, we see that the average visitor on this website can handle about 6 ads per page. After 6, the bounce rate tends to jump way up. Great, let’s put 6 ads on the page right? Wrong. If we treat visitors coming from organic search this way, we nearly triple our bounce rate for these users; harming revenue and potentially search traffic. A.I. can help publishers step in here and adjust things like ad density based on who’s viewing the page. This is really where data science and A.I. come together for publishers. Most publishers can actually start to do this without using A.I. Below are some quick and easy directions. I’ve also included a few helpful links for the non-technical. How to script users on your site. Ultimately, A.I. will be a more integrated part of the internet experience for most users in the near future. 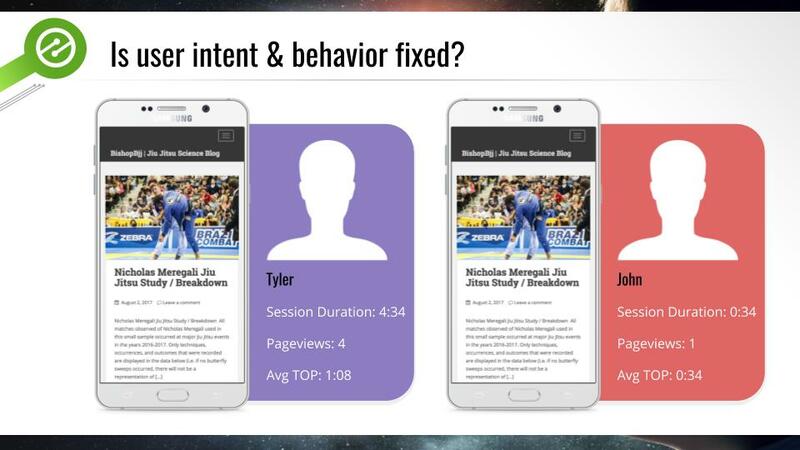 Visitors will expect some level of personalization from publishers. The most innovative and fastest-moving publishers to these trends will have the most to gain. 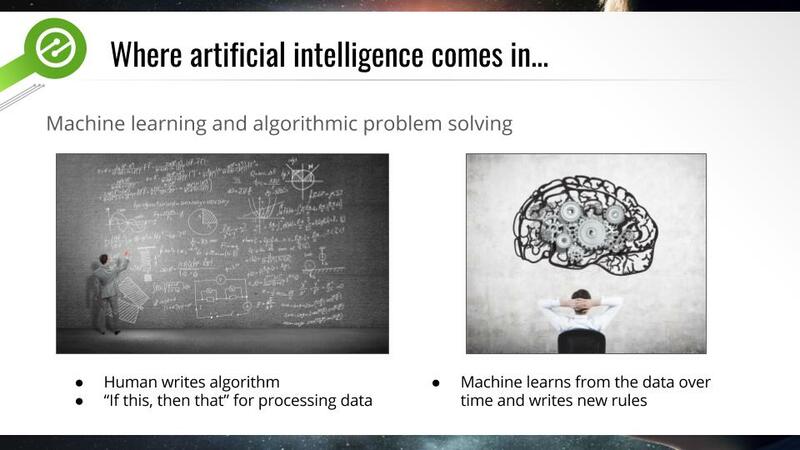 It’s important to understand the difference between machine learning and algorithmic problem solving as these things continue to ramp up. While both offer benefits in the way of personalization. It is machine learning that ultimately will allow publishers the true ability to scale these processes (more on the differences between A.I. and algorithms here). 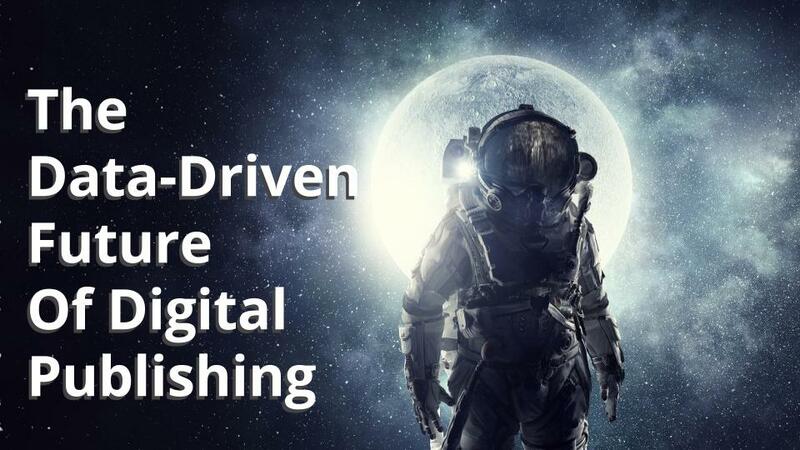 The future of digital publishing will be is data-driven, but that doesn’t mean that quality content and all the other core facets will change. It simply means there will be more and more on top of the traditional practices of publishing to account for in order to stay competitive as a publisher. 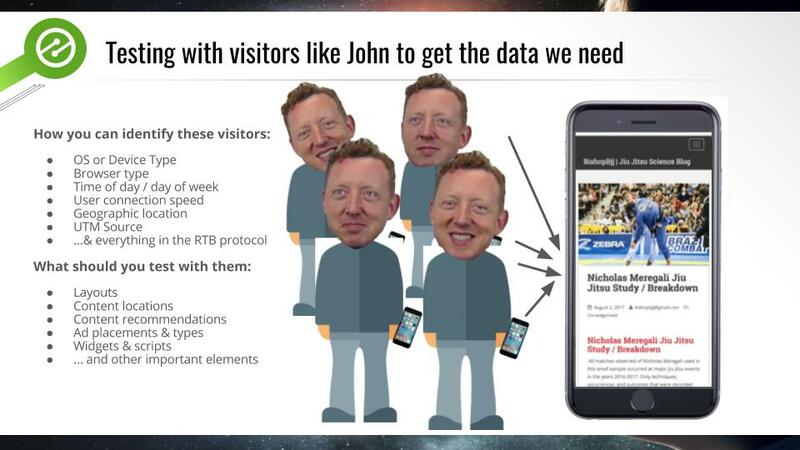 Data will help publishers connect to their audience far beyond what was ever conceivable back in the early days of the newspaper, but will still help publishers achieve what they have always been trying to achieve… a greater connection to their reader. This is quite a long read but definitely worth reading it! Really commendable. I will definitely try to improve my site with these tactics. A bunch of thanks for the information.